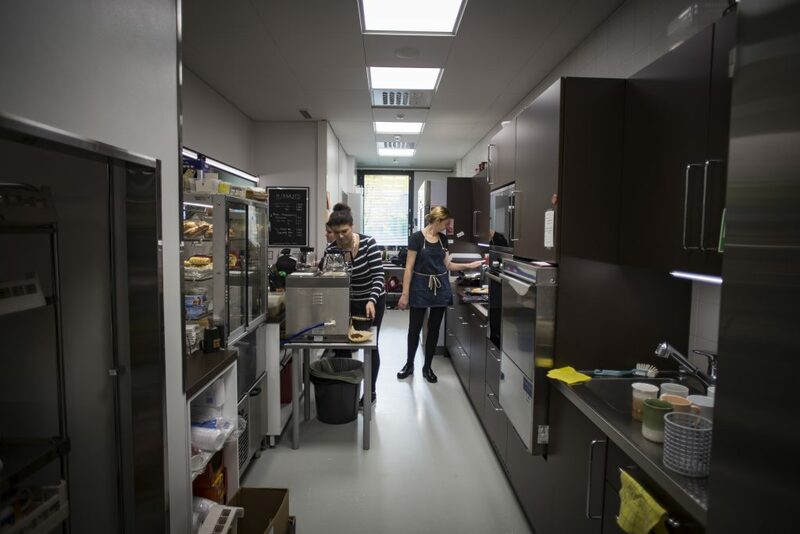 In August, the Faculty of Humanities of the University of Oulu relocated from the north-end of the campus to the third floor of corridors J and K. In the process, many things changed: now sharing spaces has become a part of the every-day life of both the staff and the student societies. Many think that, in the end, the relocation went surprisingly smoothly. 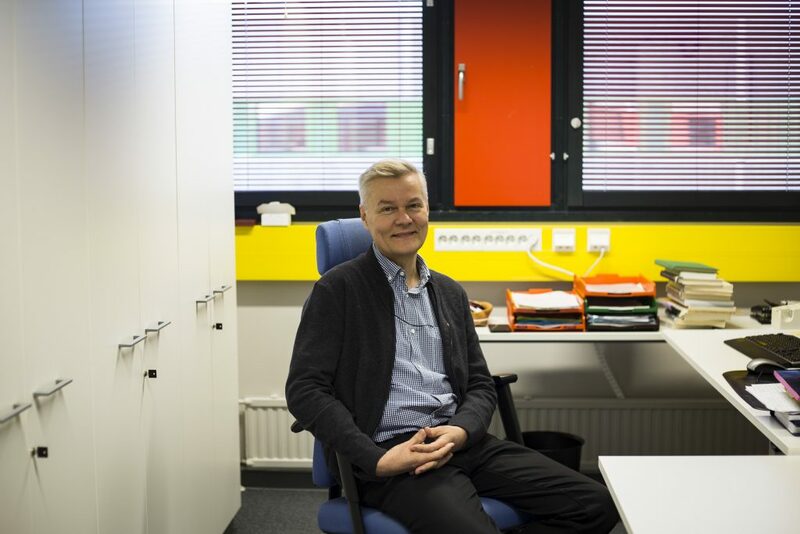 ”We have adapted here”, says Harri Mantila, Faculty’s Dean of Education and Professor of Finnish language. When you spend years living in one place, stuff tends to accumulate. Everyone who has ever moved knows that. The situation is nothing new to the humanists, either. The Faculty, which moved from Kasarmintie to Linnanmaa in 1992, spent quarter of a century in the same address. In August, the Faculty relocated from the north-end of the campus to new premises located near the centre lobby. The new premises can be accessed from stairways located along Fysiikankatu, Geokatu and ATK-katu. The moving process commenced on August 1st, and the last of the moving boxes found their places in the new premises on the third-floor on August 8th. A huge amount of preparation work was required to successfully move the faculty from the north-end of the campus to the vicinity of the centre lobby. 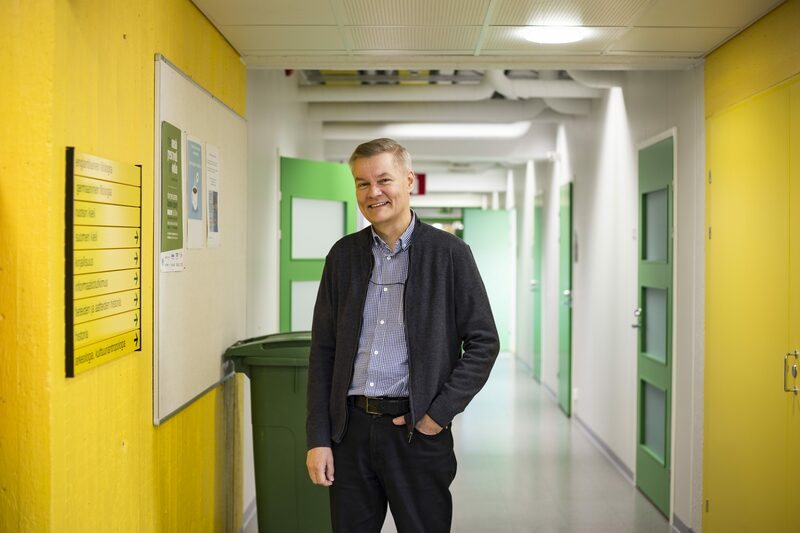 According to Harri Mantila, a professor of Finnish Language and the the Faculty of Humanities’s person in charge of the move, the move went extremely well all in all. He gives special thanks to Martela, who oversaw of the whole process: during the move, 2000 moving boxes were relocated within the campus, and what’s more, even to their right destinations. He also praises the University’s project engineer Juhana Hietamäki. Even though the boxes were moved on time, there were still signs of unfinished work when the faculty members arrived in their new premises: the electrical work was still in progress and not all the furniture had found its place before the moving day. In August, the audio-visual settings in the premises were still not ready, and the therapy facilities for logopaedics were ready to use only in the beginning of September. Despite all this, the Faculty of Humanities managed, and the problem of the missing electricity was solved by a couple of creatively placed extension cords. Minor repairs have been done during the autumn. In two months, the facilities suffered water damage four times, three times through the roof, once through the big window at the end of a corridor. These problems have been swiftly handled and the fixed, says Mantila. August was a transition period for the Faculty. Adapting was made easier by the fact that the students returned to the campus only in the beginning of September, with the exception of a couple of stray students working on their pro gradu -theses, says Mantila. The subjects of Humanities moved one floor at a time. First to move from the first floor were the Finnish Language, Information Studies, and Logopaedics departments, followed by the languages, and finally by the Literature and History department, as well as the Giellagas Institute previously located in the third floor. Even though relocating from the new end of the campus to the vicinity of the centre lobby went relatively quickly, according to Mantila’s estimate, the inventory work that preceded the move was extensive. Since there is a lot less storage room in the new facilities, the archives of the Faculty had to be gone through carefully and meticulously. Preparation for the move lasted the whole of last winter, and as winter turned into spring, the amount of stuff grew smaller and smaller. As a consequence of the clean-up work some material was moved to other storage facilities. For example, second copies of master’s theses previously stored in the facilities of the faculty’s degree programmes were relocated to the central archive of the university located behind Tellus. The Owambo collection of Missionary Karl Emil Liljeblad (1876–1937) also found a new home in the University’s storage facility in Rusko. One of the central features of the new facilities on the third floor are the shared offices. On the third floor, only the faculty’s professors have their own, single rooms. University lecturers share rooms with one or two other people, whereas researchers room with approximately four other people. The biggest office for researchers has eight occupants. A space for all 186 faculty members could be found along two hallways. The other newly renovated hallway houses the Giellagas Institute, the department of logopaedics and the researchers’ offices, and the other hallway, renovated a couple years ago, houses the departments of languages, history and communication sciences. Sharing spaces effects the every-day life so that students can no longer show up for tutoring whenever, but instead the tutoring sessions must be pre-planned. According to Harri Mantila there are some meeting rooms and spaces to retreat to along both hallways that can be used, for example, to hold master’s thesis tutoring sessions. Many members of the staff also have new, stricter-than-before office hours, when it is possible for student to receive tutoring. Some of the people sharing an office work from home, so that there are some days of the week when people using the same office have the whole space for themselves. “We have not heard people whining about not getting to talk to teachers, but then again we have not been here long. We’ll see how this works out in the end,” says Mantila. According to him, the student feedback has consisted of comments on how hard it is to find the new facilities. Mantila’s office was especially hard to find, since his door was behind another large door. Mantila points out, however, that there is clearly marked signage to guide you to the different degree programmes, as long as one has the patience to read them. In the previous premises of the Faculty of Humanities, especially in the premises of the logopaedics department, many people complained about the indoor air. The problem has not been found in the new facilities, says Mantila. The quality of indoor air is under close monitoring: the renovated hallway has ten sensors that measure the air quality and report the data to the University Properties of Finland (SYK). Some classes for humanities have been held in the northern end of the campus during the autumn. The university loses the option of using the north-end facilities, as SYK starts renovating them for the Oulu University of Applied Sciences (Oulu UAS) at the end of this year. In fact, starting the beginning of next year, all university courses should be held on the old side of the campus. According to Harri Mantila’s estimate, the facilities that are now in use can facilitate the teaching of next spring, but there is no room for new reservations or changes. Every square-inch has been reserved well in advance for use. New teaching premises are being built along the ATK-katu. However, they will only be ready by Christmas 2019. Mantila wonders how busy the centre lobby of the campus will be next year, when all Faculties of Linnanmaa campus will be located on the same side – including the Faculty of Education that is due to move by the end of this year. There is more to a big move like this than just carrying moving boxes and wiring up new sockets. “We have not received that many complaints”, Mantila says, describing the atmosphere of the Faculty. People have adapted and accepted the relocation. Mantila says that the people who have worked in the building the longest have taken the move the hardest. When the Faculty moved to Linnanmaa back in the day, the new open, spacious, and well-lit facilities were built for the Faculty specifically. “One learned to think that this is my university, the space where I will do my life’s work, that this was built for me. Us oldies – there is just a few of us – have regretted that we had to be here to witness this. If it had been my choice, I would have remained were we were,” says Mantila. He began his studies in Oulu in 1979 and started working as a member of the staff in 1983. During his career he has witnessed three faculty premises: the Snellmania facilities at the old Åström leather factory, the new premises completed in Linnanmaa at 1992, and now these new third-floor facilities. “But, like I said, there are only a few of us oldies here – and some people have even been excited,” he says. Younger researchers have found the move exciting, Mantila says. Harri Mantila highlights the importance of the new break rooms. Now the there are two shared break rooms for the whole faculty instead of each degree programme having their own separate staff rooms. One can hear new stories from people one has never met before in the shared break rooms. “It is also nice to be able to tell old stories again to a new audience” Mantila laughs. On the other hand, at the same time one longs for the intimacy of the old staffroom. Behind one of the doors of researchers’ rooms, you can find Nina Työlahti, one of the lecturers of literature. When questioned about the new facilities, she responds rather diplomatically that it takes time to learn new things: learning where everything is now as well as learning new models of behaviour. One new thing to learn is that after the move all lectures of one course might be held in different lecture halls. For the first time ever, she is sharing an office with another researcher, which has also required cutting down the number of books. 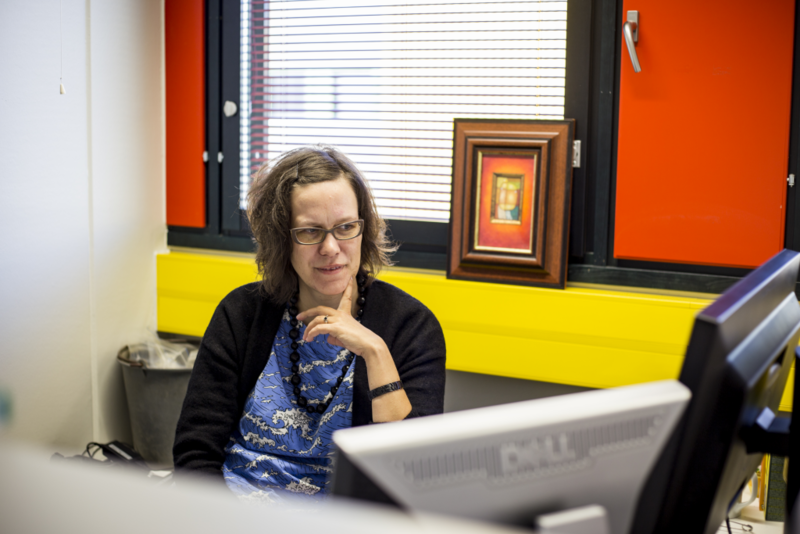 Tiina Äikäs, a researcher of archaeology, also works in the office shared by three people. In her experience the move went well, discounting having to wait for one chair to arrive a bit longer. “However, moving during summer time was a bit of a problem for us archaeologists, since we do field work during summers,” she says with a laugh. She has started to feel at home at the new facilities. She has previous experience with shared offices from the time she was working on her doctoral thesis, so she has not had a problem with getting accustomed to sharing an office with two other researchers. The only times when there are problems are when she is tutoring students, since that requires peace and quiet. Organising tutoring sessions requires more mental effort and planning than it did previously. To her surprise she found that, for example, one cannot just waltz into Tellus willy-nilly and expect to find a space for calm conversation. Äikäs finds the new location of her office good, although the library is farther away. For an archaeologist the new location is convenient since the offices, the laboratory of archaeology and the GIS laboratory are close together. ”You notice funny little things working in a shared office”, says archaeologist Tiina Äikäs. The guild rooms of students of humanities and the Humus Café relocated to new premises along with the Faculty. The guild rooms of the student societies and Humus, the café of the Guild of Humanities, are located on the first floor along Geokatu. According to Heidi Halkola, a member of the Humus Café staff, the move went better than anyone dared to hope. All equipment and boxes found their way to their destination in the right order. Now the problem is that not all previous Humus patrons have found the new facilities. In other words, one will not just wander into the café like they used to, instead one must make a conscious decision to have coffee at Geokatu. Halkola says that their clientele has pretty much stayed the same. However, the fact that the staff members of the Faculty of Humanities got a coffee machine in their new facilities can be seen. A bigger impact is caused by the fact that Juvenes sells coffee for less than 50 cents per cup. The staff members find the new kitchen facilities good: spacious enough for a couple of workers to move around and enough storage space. The facilities get minor complaints for their floor: it must be constantly mopped since dirt shows instantly. Another positive thing Halkola notes is that the air flows better since windows are of a more reasonable size. The staff members find the new kitchen facilities good: spacious enough for a couple of workers to move around and enough storage space. Pictured on the left is Heidi Halkola, on right Anne Paakkari. You can notice one change in the new Humus: according to Heidi Halkola, people do not come just to hang-out and sit around for long periods of time anymore as much as they used to. Off-peak times are more noticeable in the new location. Perhaps the reason is that there are less seats for customers. When there are less tables and chairs the customers do not dare to just sit and take space from other potential customers. According to the Chair of the Guild of Humanities Elina Honkanen, the practicalities of the Guilds relocation went well. No items were lost, and the boxes arrived at their destination just when they should have. However, one had to worry a bit about the situation of Humus, since as the relocation process started there was no information available on when the café’s stuff would be moved. At the time of the interview, in the middle of September, the relocation of the Guild was ready, and it was turn to think about how to advertise the new Humus. Honkanen notes that not all previous patrons have found their way to Geokatu. ”There are less seats for customers, which is why it seems we are always full. 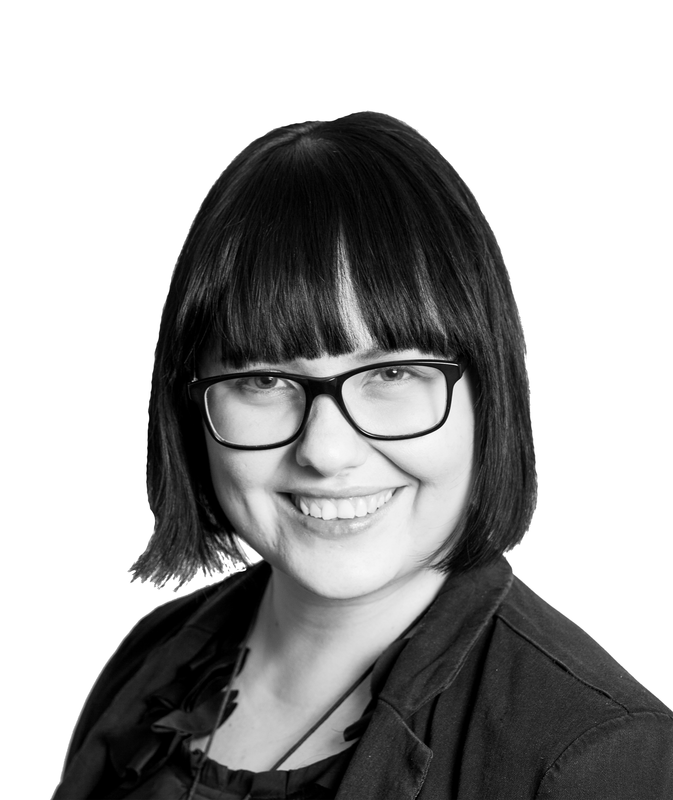 Sales-wise that’s not the case”, says Elina Honkanen about Humus. Oulu Student Magazine asked all chairs of humanistic subject societies of Oulu, how the relocation had gone in their opinion. One notion was repeated in the answers: in the end the relocation was even surprisingly easy and painless. However, the sparse and unclear information available from the university received criticism. Likewise, Jenny Kärki, the Chair of Index ry, says that there had been “some inconsistencies regarding the time tables or interruptions in the flow of information” that caused more work for the society. Siru Uusi-Seppälä, the Chair of Kultu, mentions mix-ups with moving boxes. Additionally, she found the feedback on the things that were still to be done and on clearing out the rooms given to the student societies to be a bit too vague. In the spring of 2017, the news of the relocations caused waves: in April, dissatisfied humanists brought their guild rooms and the Humus Café to Geokatu for one day, and later in May, the students held another protest. Heidi Niemi, the chair of Timppa ry, said for them the move went smoothly, since their society does not really have that many earthly belongings. Because of the move their society gained more storage space and a guild room which they previously did not have. Members of student societies have varying success in finding their way to the new shared guild rooms. According to Jenny Kärki a couple of Index members ”have been seen in the new facilities”, but that it would be nice if more of them found their way in. The student society plans to make that happen by investing in appealing equipment and furniture, such as comfortable chairs and new computers. “The difference between the old and the new is pretty big, but I have sensed that the general atmosphere is positive: breathable air, the new equipment and surfaces as well as functional mobile connectivity are apparently more important than the old familiar space. I’m also happy that some freshers have also found the guild room, which I think I is the most important thing” Emilia Käsmä says. “It is our intention to organise more events in the guild room so that everyone would start to feel at home there and so that people who have not previously used the room would be encouraged to drop in and say hi to acquaintances and to network,” Siru Uusi-Seppälä says. Máren-Elle Länsman, the Chair of Gieku, says that she has heard people praising the guild room’s décor. “Before we relocated, we had not used our guild room in two years due to poor quality indoor air. I think our members are getting used to the idea that we even have our own space to hang-out in. I believe that the numbers of people visiting the guild room will increase as the seasons change”, says Länsman. According to the Chair’s answers, some students have found it hard to find the new facilities. Additionally, not everyone has liked the new décor of the guild rooms. 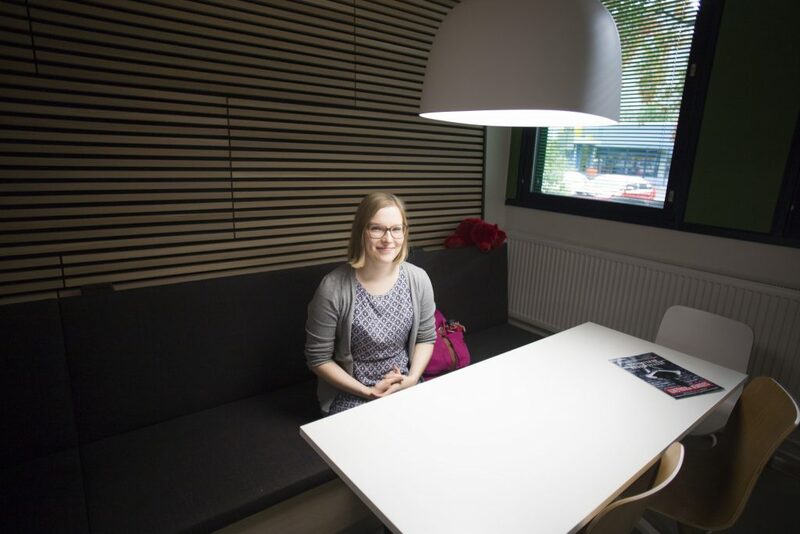 According to Elina Karjalainen, students of logopaedics have given positive feedback on the new facilities. The new therapy facilities are downright amazing, and likewise getting an extra room warms their hearts even though there is less space than before. The chairs give praise to student representatives for their influencing work in the facility reform. According to Emilia Käsmä, the chair of Suma, the members of the facilities working group have been irreplaceable. The chairs say that the shared guild rooms have had a positive impact on collaboration between student societies. No arguments or conflicting opinions regarding the use of the facilities were mentioned. “From the start, we laid down the rules, that were drawn up in a joint meeting of the student societies, so everyone is on the same page on how one should behave in the guild room. I think the atmosphere has generally been good and inviting, new faces are welcomed and included in conversations” Máren-Elle Länsman, the Chair of Gieku, says. ”Shared guild corridor is a nice thing, since on there and on Humus you can easily meet up with new students. It’s easy to go to the next room to borrow something, ask for advice or just to hang out with someone”, says Roosa Heinonen, Chair of Verba. “As long as we remember that we are sharing the space with others and make sure that everyone is comfortable, don’t bully anyone and are nice to everyone, it’s all going to be fine” Jenny Kärki sums-up. “It has been wonderful to see that the humanists have shared a community spirit in all different stages of the relocation process. It has been a great help in the times when we felt that we are running out of strength, time, and common sense in matters regarding the move. I want to thank all those who have actively advocated for student guild rooms and gave of their time so that the relocation process would be finished honourably”, the Chair of Kultu, Siru Uusi-Seppälä says. ”Us oldies – there is just a few of us – have regretted that we had to be here to witness this. If it had been my choice, I would have remained where we were,” says Harri Mantila. Already crowded, how about in the future? The practical preparation for the Faculty’s move started in Spring Semester 2017 when the preparation working group was established. The big tumult started in the Faculty in August 2017. The staff organised days when the facilities were cleaned out and papers, office equipment and research material, that had already been digitized were deemed to be of no use and thrown away. “The Vice Rector of Education [Helka-Liisa Hentilä] said that we had made the move into a carnival. And, indeed, that was a conscious choice, to make the relocation process fun and easy. Since it was not really fun to go”, Mantila says. As the humanists packed up their stuff, for example, old computers from the 80s were dug out from the sediment (“With floppy disc drives, nobody had used them in decades”). A couple of moving boxes from last move were also uncovered, still unopened. This move also means a change in the language we use. Matti Peltokangas’s Yhtyvät säteet -artwork (“Connecting radii”) made from red granite stands in the Faculty’s old courtyard. It is commonly known as the “humanist ball”, humanistipallo. What will become of the ball, professor of Finnish language Harri Mantila? Will it become the “ball of the University of Applied sciences”? Mantila cannot say. He expresses his discontent with not being able to relocate the ball to the new facilities along with the rest of the Faculty. The scale model of Valmarinniemi archeological site and the glass cabinet of Giellagas Institute act as remainders of the old Faculty, but the humanistipallo had to stay put. “It is a real shame, since the ball ironically symbolises humanities: rutted and circular. We might have to come up with another ironic joke we can base our identity on. It would be nice to have similar sign to mark our existence – since we happen to find questions of identity important”, he laughs. Edited 16th of November 12.36: Minor changes to Tiina Äikäs’ quote.